Following the excommunication in 1570 of the English monarch Elizabeth, the Protestant English in Ireland increased their confiscations of Catholic held lands. In the newly established Queen’s and King’s counties (present day Laois and Offaly ) the Lord Deputy Sir Henry Sidney hatched a plan with two planters, Francis Cosby and Hartpole to break the power of the local Gaelic clans. This plan would lead to the battle of Glenmalure. In the year 1577, aided by the O’Dempsy clan, who were Catholic and true Gaelic stock, the Protestant English invited approximately 400 members of the leading families, to a great feast in the rath at Mullaghmast. The English, with their O’Dempsy hirelings foully betrayed these people and fell to killing them, men women and children. Over 40 local clan chiefs, O’Moores, O’Lalors, O’Nolans, etc. were massacred. Amongst the few survivors was Rory Óg Ó Moore who took to a guerrilla war, attacking government outposts wherever he found them, and one of his supporters was Fiach MacHugh O’Byrne, his brother- in-law. 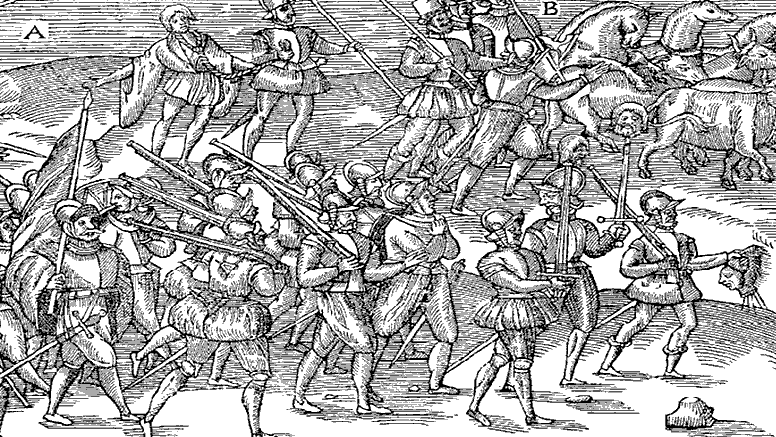 Rory Óg’s war was brought to a halt when he was killed in 1578 when he was killed by the Fitzpatricks. Like the O’Moores and the O’Lalors, the O’Byrnes of Gabhal Raghnall, with their headquarters in Balinacor county Wicklow, resented the English intruders. Fiach MacHugh was not unknown to the English. He had had quite a few run battles with them and was at the time of the Mullaghmast incident, being pursued because of his refusal to allow English interference in his clan territory. MacHugh’s main enemy seems to have been the ruthless and murderous governor (seneschal) Thomas Masterson. This enmity was maintained all through the 1570’s and the Mullaghmast massacre had done nothing to make the Gaelic Irish place any trust in the English. Instead the Irish Catholics began to hope in the Pope raising an army from Catholic countries that would invade Ireland and relieve her from the English heretics. In 1579 Fiach MacHugh was to form an alliance with the Anglo Irish James Eustace, new third viscount of Baltinglass. The Viscount, a Catholic was related to many of the Catholic Anglo-Irish families of the Pale and with them shared a growing anger and resentment against the Protestant New English. He was particularly angered by the recent execution of some twenty Catholic gentlemen by the new Lord Deputy, Arthur Grey de Wilton. Baltinglass, appealing to other Old English families, went into rebellion and in turn, Fiach called upon his neighbouring clans, such as the Kavanaghs, a clan that had felt Masterson’s cruelty, the O’ Connors, the O’ Tooles and the O’ Moores, for support. The English authorities were filled with trepidation for fortified by rumours of continental support, the Desmonds of Munster and the O’ Neills of Tyrone were already in rebellion. The O’ Neills and their allies began to strike south and raid into the Pale. Likewise, the O’ Byrnes were striking into the Pale from the south and also raiding into Wexford. The English pulled reinforcements into Ireland and by mid August, Grey de Wilton felt that he had to move against Baltinglass and O’ Byrne. His idea was to take the rebel stronghold of Balinacor and on the 18th of August he march west out of Dublin to Naas where he rendezvoused with the Earl of Kildare and Sir Francis Cosby. This combined force numbered around 3,000 men, many of whom were raw English recruits without experience in fighting the Irish. Glenmalure is a steep U shaped valley and is surrounded by forests and bogs. The terrain is difficult to transverse but the Irish are knowledgeable of their own territories whist Grey was not. It is thought that he had rejected advice of his officers, possibly because he underestimated the strength or fighting abilities of the rebel Irish. As Grey de Wilton approached the Glen his advance was observed by the Irish. O’ Byrne kept pulling his men back and Grey was unwittingly walking into a trap. When he reached the approaches to the glen he advanced 1,500 of his men in battle formation in the belief that he would be able to flush out the rebels and then decimate them with his calvary. Baltinglass and O’ Byrne had their men hidden in the forest on the steep mountain slopes lining the valley. As the English march deep into the glen the Irish opened fire on them. The sniping was to cause the English soldiers to panic and as their lines disintegrated, the Irish Kerns, lightly armed and swift moving infantry who had been concealed in the bracken and forests, attacked. Over 800 English perished that day and as they fled they shed their weapons, abandoning them to the Irish. It was Grey’s cavalry which saved many of the retreating troops. Nevertheless Grey fled with his army back to Dublin and the Irish harried him all the way. The defeat of Grey’s army was the worst defeat suffered by the English in Ireland since 1318 and 1399. It is interesting to note that the O’ Moores were avenged when the infamous Francis Cosby lost his life in the battle along with Peter Carew and Colonel George Moore. In the aftermath of the battle the rebels were unable to sustain their success and fell back to harassment and small scale attacks. The English Protestants on the other hand became much more determine to destroy the remaining Catholic Old English families. The Battle of Glenmalure. By Emmett O’ Byrne M. Phil. The O Byrne Clan website. Last updated October 25, 2015.